References used for Neem oil information page. Looking to buy Neem oil? Chopra, R. N., Nayer, S. L. and Chopra, I. C., Glossary of Indian Medicinal Plants, CSIR, New Delhi, 1956. Chopra, R. N., Chopra, I. C, Handa, K. L. and Kapur, L. D. (eds), Indigenous Drugs of India, U.N. Dhur and Sons, Kolkata, 1958, pp. 51–595. Kirtikar, K. R. and Basu, B. D., in Medicinal Plants (eds Blatter, E., Cains, J. F., Mhaskar, K. S.), Vivek Vihar, New Delhi, 1975, p. 536. Thakur, R. S., Singh, S. B. and Goswami, A., Curr. Res. Med. Aromat. Plants, 1981, 3, 135–140. Koul, O., Isman, M. B. and Ketkar, C. M., Can. J. Bot., 1990, 68, 1–11. Chatterjee, A. and Pakrashi, S. (eds), The Treatise on Indian Medicinal Plants, 1994, vol. 3, p. 76. Schmutterer, H. (ed. ), The Neem Tree: Source of Unique Natural Products for Integrated Pest Management, Medicine, Industry and Other Purposes, VCH, Weinheim, Germany, 1995, pp. 1–696. Singh, R. P., Chari, M. S., Raheja, A. K. and Kraus, W., Neem and Environment, Oxford & IBH Publishing, New Delhi, 1996, Vols I and II, pp. 1–1198. De Jussieu, A., Mem. Mus. Hist. Nat., Paris, 1830, 19, 220. Pennington, T. D. and Styles, B. T., Blumea, 1975, 22, 419–540. Pennington, T. D., Flora Neotropica, New York Botanical Garden, NY, Monogr. No. 28, 1981. Siddiqui, S., Curr. Sci., 1942, 11, 278–279. Mitra, C. R., Neem, Dr M. S. Patel, Indian Central Oilseeds Committee, Hyderabad, 1963, pp. 69–94. Warthen, J. D. Jr., US Dept. of Agric. Sci. and Educ. Admin. Agric. Rev. and Man., ARM-NE-4, 1979, pp. 1–21. Taylor, D. A. H., Prog. Chem. Org. Nat. Prod., 1984, 45, 1– 101. Champagne, D. E., Koul, O., Isman, M. B., Scudder, G. G. E. and Towers, G. H. N., Phytochemistry, 1992, 31, 377–394. Kraus, W., in The Neem Tree: Source of Unique Natural Products for Integrated Pest Management, Medicine, Industry and Other Purposes (ed. Schmutterer, H.), 1995, pp 35–88. Devakumar, C. and SukhDev, in Neem (eds Randhawa and Parmar, B. S.), 1996, 2nd edn, pp. 77–110. Govindachari, T. R., Curr. Sci., 1992, 63, 117–122. Mitra, C. R., Garg, H. S. and Pandey, G. N., Phytochemistry, 1971, 10, 857–864. Bhargava, K. P., Gupta, M. B., Gupta, G. P. and Mitra, C. R., Indian J. Med. Res., 1970, 58, 724–730. Pillai, N. R. and Santhakumari, G., Planta Med., 1981, 43, 59–63. David, S. N., Mediscope, 1969, 12, 25–27. Pillai, N. R. and Santhakumari, G., Indian J. Med. Res., 1981, 74, 931–933. Pillai, N. R. and Santhakumari, G., Planta Med., 1984, 50, 143– 146. Pillai, N. R., Seshadri, D. S. and Santhakumari, G., Indian J. Med. Res., 1978, 68, 169–175. Pillai, N. R. and Santhakumari, G., Ancient Sci. Life, 1985, 5, 91–97. Sharma, V. N. and Saksena, K. P., Indian J. Med. Res., 1959, 13, 1038. Sharma, V. N. and Saksena, K. P., ibid, 1959, 47, 322. Murthy, S. P. and Sirsi, M., Indian J. Physiol. Pharmacol., 1958, 2, 387–396. Bhide, N. K., Mehta, D. J. and Lewis, R. A., Indian J. Med. Sci., 1958, 12, 141–145. Rochanakij, S., Thebtaranonth, Y., Yenjal, C. H. and Yuthavong, Y., Southeast Asian J. Trop. Med. Public Health, 1985, 16, 66–72. Khalid, S. A., Duddect, H. and Gonzalez-Sierra, M. J., J. Nat. Prod., 1989, 52, 922–927. Rojanapo, W., Suwanno, S., Somaree, R., Glinsukon, T. and Thebtaranonth, Y., J. Sci. Thailand, 1985, 11, 177–188. Rao, B. S., Nazma and Rao, J. M., Curr. Sci., 1977, 46, 714–716. Butterworth, J. H. and Morgan, E. D., J. Chem. Soc. Chem. Commun., 1968, 23–24. Jones, I., Ley, S. V., Denholm, A. A., Lovell, H., Wood, A. and Sinden, R. E., FEMS Microbiol. Lett., 1994, 120, 267–273. Van der Nat, J. M., Van der Sluis, W. G., ’t Hart, L. A., Van Disk, H., de Silva, K. T. D. and Labadie, R. P., Planta Med., 1991, 57, 65–68. Ara, I., Siddiqui, B. S., Faizi, S. and Siddiqui, S., J. Chem. Soc., Perkin Trans., 1989, I, 343–345. Pant, N., Garg, H. S., Madhusudanan, K. P. and Bhakuni, D. S., Fitoterapia, 1986, 57, 302–304. Kakai Tokkyo Koho, J. P., Chem. Abstr., 1984, 100, 91350. Fujiwara, T., Takeda, T., Ogihara, Y., Shimizu, M., Nomura, T. and Tomita, Y., Chem. Pharm. Bull., 1982, 30, 4025–4030. Fujiwara, T., Sugishita, E., Takeda, T., Ogihara, Y., Shimizu, M., Nomura, T. and Tomita, Y., ibid, 1984, 32, 1385–1391. Vander Nat, J. M., Kierx, J. P. A. M., Van Dijk, H., De Silva, K. T. D. and Labadie, R. P., J. Ethnopharmacol., 1987, 19, 125– 131. Vander Nat, J. M., Hart, L. A. T., Vander Sluis, W. G., Van Dijk, H., Vander Berg, A. J. J., De Silva, K. T. D. and Labadie, R. P., ibid, 1989, 27, 15–24. Moursi, S. A. H. and Al-Khatib, I. M., Jpn J. Pharmacol., 1984, 36, 527–533. Dymock, Pharmacogr. Ind., 1890, 1, 324. Varma, G. S., Miracles of Neem Tree, Rasayan Pharmacy, New Delhi, 1976. Lirtikar, K. R. and Basu, B. D., in Indian Medicinal Plants, Lalitha Mohan Basu, Allahabad, 1935, 2nd edn, p. 536. Ketkar, A. Y. and Ketkar, C. M., in The Neem Tree: Source of Unique Natural Products for Integrated Pest Management, Medicine, Industry and Other Purposes (ed. Schmutterer, H.), 1995, pp. 518–525. Tidjani, M. A., Dupont, C. and Wepierre, J., Planta Med. Phytother., 1989, 23, 259–266. Lorenz, H. K. P., J. Praxis, 1976, 8, 231–233. Murthy, S. P. and Sirsi, M., Indian J. Physiol. Pharmacol., 1958, 2, 456–460. Okpanyi, S. N. and Ezeukwv., G. C., Planta Med., 1981, 41, 34–39. Vohra, S. B. and Dandiya, P. C., Fitoterapia, 1992, 63, 195–207. Jacobson, M., Neem Newsl., 1986, 3, 39–43. Njiro, S. M. and Kafi-Tsekpo, M. W., Ondersterpoort J. Vet. Res., 1999, 66, 59–62. Sen, P., Medinata, P. K. and Ray, A., Indian J. Exp. Biol., 1992, 12, 1170–1175. Ray, A., Banerjee, B. D. and Sen, P., ibid, 1996, 34, 698–701. Upadhyay, S. N., Dhawan, S., Garg, S. and Talwar, G. P., Int. J. Immunopharmacol., 1992, 14, 1187–1193. Murty, K. S., Rao, D. N., Rao, D. K. and Murty, L. B. G., Indian J. Pharmacol., 1978, 10, 247–250. El-Hawary, Z. M. and Kholief, T. S., Arch. Pharmacol. Res., 1990, 13, 108–112. Chakraborty, T., Uerotta, L. and Poddar, G., Phytother. Res., 1989, 3, 30–32. Khosla, P., Bhanwra, S., Singh, J., Seth, S. and Srivastava, R. K., Indian J. Physiol. Pharmacol., 2000, 44, 69–74. Chattopadhyay, R. R., Gen. Pharmacol., 1996, 27, 431–434. Chattopadhyay, R. R., J. Ethnopharmacol., 1999, 67, 373–376. Garg, G. P., Nigam, S. K. and Ogle, C. W., Planta Med., 1993, 59, 215–217. Bandyopadhyay, U., Chatterjee, R. and Bandyopadhyay, R., US Patent 5,730,986, 1998; corresponding to Indian Patent 1100/Del/95. Sinha, K. C. et al., Indian J. Med. Res., 1984, 79, 131–136. Upadhyay, S. N., Kaushic, C. and Talwar, G. P., Proc. R. Soc. London B, 1990, 242, 175–179. Upadhyay, S., Dhawan, S., Sharma, M. G. and Talwar, G. P. Contraception, 1994, 49, 161–169. Kaushic, C. and Upadhyay, S., ibid, 1995, 51, 203–207. Despande, V. Y., Mendulkar, K. N. and Sadre, N. L., J. Postgrad. Med. (Bombay), 1980, 26, 167–170. Mukherjee, S., Lohiya, N. K., Pal, R., Sharma, M. G. and Talwar, G. P., Contraception, 1996, 53, 375–378. Mukherjee, S., Garg, S. and Talwar, G. P., J. Ethnopharmacol., 1999, 67, 287–296. Khalid, S. A., Farouk, A., Geary, T. G. and Jensen, J. B., ibid, 1986, 15, 201–209. Badani, L., Deolankar, R. P., Kulkarni, M. M., Nagsampgi, B. A. and Wagh, U. V., Indian J. Malariol., 1987, 24, 111–117. Dhar, R., Zhang, K., Talwar, G. P., Garg, S. and Kumar, N., J. Ethnopharmacol., 1998, 61, 31–39. Khan, M. and Wassilew, S. W., in Natural Pesticides from the Neem Tree and Other Tropical Plants (eds Schmutterer, H. and Asher, K. R. S.), GTZ, Eschborn, Germany, 1987, pp. 645– 650. Chopra, I. C., Gupta, K. C. and Nair, B. N., Indian J. Med. Res., 1952, 40, 511–515. Satyavati, G. V., Raina, M. K. and Sharma, M. (eds), Medicinal Plants of India, 1976, vol. I.
Almas, K., Indian J. Dent. Res., 1999, 10, 23–26. SaiRam, M. et al., J. Ethnopharmacol., 2000, 71, 377–382. Baswa, M., Rath, C. C., Dash, S. K. and Mishra, R. K., Microbios., 2001, 105, 183–189. Rao, A. R., Kumar, S., Paramsivam, T. B., Kamalakshi, S., Parashuram, A. R. and Shantha, M., Indian J. Med. Res., 1969, 57, 495–502. Gogati, S. S. and Marathe, A. D., J. Res. Educ. Indian Med., 1989, 8, 1–5. Badam, L., Joshi, S. P. and Bedekar, S. S., J. Commun. Dis., 1999, 31, 79–90. Balasenthil, S., Arivazhagan, S., Ramachandran, C. R. and Nagini, S., J. Ethnopharmacol., 1999, 67, 189–195. Arivazhagan, S., Balasenthil, S. and Nagini, S., Cell Biochem. Funct., 2000, 18, 17–21. Arivazhagan, S., Balasenthil, S. and Nagini, S., Phytother. Res., 2000, 14, 291–293. Bhanwra, S., Singh, J. and Khosla, P., Indian J. Physiol. Pharmacol., 2000, 44, 64–68. Rao, A. D., Devi, K. N. and Thyagaraju, K., J. Enzyme Inhib., 1998, 14, 85–86. Singh, S. D., Junnarkar, A. Y., Reddi, G. S. and Singh, K. V., Fitoterapia, 1987, 58, 235–238. Singh, P. P., Junnarkar, A. Y.,Thomas, G. P., Tripathi, R. M. and Varma, R. K., ibid, 1980, 61, 164–168. Jaiswal A. K., Bhattacharya, S. K. and Acharya, S. B., Indian J. Exp. Biol., 1994, 32, 489–491. Bhakuni, D. S., Dhar, M. L., Dhar, M. M., Dhawan, B. N., Gupta, B. and Srimal, R. C., ibid, 1971, 9, 91–102. Abraham, Z., Bhakuni, D. S., Garg, H. S., Goel, A. K., Mehrotra, B. N. and Patnaik, G. K., ibid, 1986, 24, 48–68. Kanungo, D., in Neem (eds Randhawa and Parmar, B. S.), 1996, 2nd edn, pp. 77–110. Charles, V. and Charles, S. X., Trop. Geogr. Med., 1992, 44, 178–181. Report, Board on Science and Technology for International Development, National Research Council, National Academy Press, Washington DC, 1992, pp. 60–113. Njoku, O. U., Alumanah, E. O. and Meremikwu, C. U., Boll. Chim. Farm., 2001, 140, 367–370. Hartwell, J. L., Quarterman Lawrence Mass., 1982, 33, 181. Talwar, G. P. et al., Indian J. Med. Res., 1995, 102, 66–70. Talwar, G. P., Raghuvanshi, P., Misra, R., Mukherjee, S. and Shah, S., Immunol. Cell Biol., 1997, 75, 190–192. Raghuvanshi, P., Bagg, R., Malhotra, D., Gopalan, S. and Talwar, G. P., Indian J. Med. Res., 2001, 113, 135–141. Shah, M. P., Seth, U. K., Bhide, N. K. and Shah, M. J., Indian J. Med. Sci., 1958, 12, 150. Gopinathan, G., MD Thesis, University of Kerala, 1973. Jacobson, M., in The Neem Tree: Source of Unique Natural Products for Integrated Pest Management, Medicine, Industry and Other Purposes (ed. Schmutterer, H.), 1995, pp. 484–495. Ali, B. H., J. Ethnopharmacol., 1992, 35, 267–273. Van der Nat, J. M., Van der Sluis, W. G., de Silva, K. T. and Labadie, R. P., ibid, 1991, 35, 1–24. Osuala, F. O. and Okwuosa, V. N., Appl. Parasitol., 1993, 34, 63–68. Singh, Y. P., Bahga, H. S. and Vijjan, V. K., Neem Newsl., 1985, 2, 17. Rao, P. U., J. Am. Oil Chem. Soc., 1987, 64, 1348–1351. Gandhi, M., Lal, R., Sankaranarayanan, A., Banerjee, C. K. and Sharma, P. L., J. Ethnopharmacol., 1988, 23, 39–51. Sinniah, D. and Baskaran, G., Lancet, 1981, 28, 487–489. Koga, Y., Yoshida, I., Kimura, A., Yoshino, M., Yamashita, F. and Sinniah, D., Paediatr. Res., 1987, 22, 184–187. Ibrahim, I. A., Khalid, S. A., Omer, S. A. and Adam, S. E., J. Ethnopharmacol., 1992, 35, 267–273. Awasthy, K. S., Cytobios, 2001, 106, 151–164. Aladakatti, R. H., Nazeer Ahmed, R., Ahmed, M. and Ghosewami, M. G., J. Basic Clin. Physiol. Pharmacol., 2001, 12, 69–76. Kasutri, M., Ahmed, R. N., Pathan, K. M., Shaikh, P. D. and Manivannan, B., Indian J. Physiol. Pharmacol., 1997, 41, 234– 240. Glinsukon, T., Somjaree, R., Piyachaturawat, P. and Thebtaranonth, Y., Toxicol. Lett., 1986, 30, 159–166. Cohen, E., Quistad, G. B. and Casida, J. E., Life Sci., 1996, 58, 1075–1081. Rahman, M. F., Siddiqui, M. K. and Jamil, K., J. Environ. Sci. Health B., 1999, 34, 873–884. Riar, S. S. et al., Contraception, 1991, 44, 319–326. Parshad VR & Ahmad N (1996). Rodent pest management in agriculture: Problems, strategies and implementation. Journal of Research of Punjab Agricultural University, 33: 266-281. Guraya SS (1998). Cellular and Molecular Biology of Gonadal Development and Maturation in Mammals. Fundamentals and Biomedical Implications. Narosa Publishing House, New Delhi, India, and Springer-Verlag, Heidelberg, Berlin, Germany. Guraya SS (2000). Comparative Cellular and Molecular Biology of Ovary in Mammals. Fundamental and Applied Aspects. Oxford & IBH Publishing Co. Pvt. Ltd., New Delhi, and Calcutta, India. Dhaliwal PK, Roop JK & Guraya SS (1999). Effect of neem-seed oil on the quantitative aspects of follicular development in cyclic female rats. Indian Journal of Ecology, 26: 162-166. Al-Tahan FJ (1994). Antifertility effect of castor bean on mice. Fitoterapia, 65: 34-37. Nwobodo EO, Nwafia WC, Ezeigbo JC & Onwughalu J (1996). The post-coital contraceptive activity of Sida linifolia. Fitoterapia, 67: 291-293. Nath D, Sethi N, Srivastava S, Jain AK & Srivastava R (1997). Teratogenic evaluation of an indigenous antifertility medicinal plant Gossypium herbaecum in rat. Fitoterapia, 68: 137-139. Jacobson M (1995). Antifertility effects and population control agents. In: Schmutterer (Editor), The Neem Tree - Azadirachta indica A. Juss and other Meliaceous plants. Published jointly by: VCH Verlagsgescll Schaft, Weinheim, Federal Republic of Germany, and VCH Publishers Inc., New York, 526-530. Dhaliwal PK, Roop JK & Guraya SS (1998). Antifertility activity of neem-seed oil in cyclic female rats. In: Dhaliwal GS, Randhawa NS, Arora A & Dhawan AK (Editors), Ecological Agriculture and Sustainable Development. Vol. 2. Indian Ecological Society and Centre for Research in Rural and Industrial Development, Chandigarh, India, 340-346. Kaur P & Guraya SS (1983). Follicular growth and kinetics during the oestrous cycle, pregnancy and post-partum in the Indian mole rat (Bandicota bengalensis). American Journal of Anatomy, 166: 469-489. Guraya SS (1997). Ovarian Biology in Buffaloes and Cattle. Indian Council of Agricultural Research, New Delhi, India. Driancourt MA, Gougeon A, Royere D & Thibault C (1993). Ovarian function. In: Thibault C & Levasseur MC (Editors), Reproduction in Mammals and Man. Ellipses, Paris, France, 281-305. Driancourt MA & Thuel B (1998). Control of oocyte growth and maturation by follicular cells and molecules present in follicular fluid: A review. Reproduction, Nutrition, Development, 38: 345-362. Patil SR, Patil SR, Bhaktaraj B & Patil SB (1999). Effect of graded doses of nicotine on ovarian and uterine activities in albino rats. Indian Journal of Experimental Biology, 37: 184-186. Dixit VP, Arya M & Lohiya NK (1976). Mechanism of action of chronically administered Cannabis extract on the female genital tract of gerbils Meriones hurrianae. Indian Journal of Physiology and Pharmacology, 20: 38-41. Singh SP & Singh K (1994). Effect of Sapindus trifoliatus seed on the fertility of female albino rats. Cell Signalling and Ova Implantation (Abstracts). The International Symposium on Cell Signalling and Ova-Implantation. All India Institute of Medical Science, New Delhi, India, November 21-23. Pathak S, Jonathan S & Prakash AO (1995). Timely administration of extract of Ferula jaeschkeana causes luteolysis in the ovary of cyclic guinea pig. Indian Journal of Physiology and Pharmacology, 39: 395-399. Patil SR, Ravindra, Patil SR, Londonkar R & Patil SB (1998). Nicotine induced ovarian and uterine changes in albino mice. Indian Journal of Physiology and Pharmacology, 42: 503-508. Helson, B.V. 1992. Naturally derived insecticides: Prospects for forestry use. Forestry Chronicle 68: 349-354. D.B. Lyons, G.C. Jones and T.A. Scarr, eds. Proceedings of a Workshop on the Pine False Webworm. CFS, Great Lakes Forestry Centre, Ontario Ministry of Natural Resources. Sault Ste. Marie, Ont. 49p. Helson, B.; Lyons, B.; de Groot, P. 1999. Evaluation of neem EC formulations containing azadirachtin for forest insect pest management in Canada. pp. 79-89 in RP Singh, RC Saxena (Eds. ), Azadirachta indica A. Juss. International. Neem Conference, Gatton, Australia, Feb. 1996. Oxford & IBH Publishing Co. PVT. Ltd. New Delhi. Lyons, D.B. ; Helson, B.V.; Jones, G.C. ; McFarlane, J.W. ; Scarr, T. 1996. Systemic activity of neem seed extracts containing azadirachtin in pine foliage for control of the pine false webworm, Acantholyda erythrocephala (Hymenoptera: Pamphiliidae). Proc. Entomol. Soc. Ont. 127: 45-55. Wanner, K.W. ; Helson, B.V.; Kostyk, B.C. 1997. Foliar and systemic applications of neem seed extract for control of spruce budworm, Choristoneura fumiferana (Clem.) (Lepidoptera:Tortricidae), infesting black and white spruce seed orchards. Can. Ent. 129: 645-655. Banken, J. O. and J. D. Stark. 1997. Stage and age influence on Susceptibility of Coccinella septempunctata after direct exposure to Neemix, a neem insecticide. J. Econ. Entomol. 90(5): 1102-1105. Copping, L.G. (Eds.) 2001. The BioPesticides Manual. Second Edition. British Crop Protection Counsel. Gill, J. S. and C. T. Lewis. 1971. Systemic action of an insect feeding deterrent. Nature (Lond.) 232:402-403. Larew, H. G. 1988. Limited occurrence of foliar-, root-, and seed-applied neem seed extract toxin in untreated plant parts. J. Econ. Entomol. 81:593-598. Lowery, D.T. and M.B. Isman. 1994. Effects of Neem and Azadirachtin on Aphids and their Natural Enemies. In Bioregulators for Crop Protection and Pest Control. P. A. Hedin (Eds) ACS Symposium Series 557. American Chemical Society, Washington, D.C. Ch. 7, 78-91. Martineau, J. AgriDyne Technologies, Inc. January 26, 1994. MSDS for Azatin-EC Biological Insecticide. Mostafa, B. and M. I. Abdel-Megeed. 1996. Molluscicidal activity of neem on Biomphalaria alexandrina. Proceedings: Sixth conference of agricultural development research 17-19 December 1996, Cairo. Annals of Agricultural Science Cairo. Special Issue, 215-232. Nisbet, A. J., J. A. T. Woodford, R. H. C. Strang, and J. D. Connoly. 1993. Systemic antifeedant effects of azadirachtin on the peach-potato aphid Myzus persicae. Entomol. Exp. Appl. 68:87-98. Osman, M. Z. and G. R. Port. 1990. Systemic action of neem seed substances against Myzus persicae. Entomol. Exp. Appl. 54:297-300. Palumbo, J. C., F. J. Reyes, C. H. Mullis, A. Amaya, L. Ledesma, and L. Carey. 2001. Neonictinoids and Azadirachtin in lettuce: comparison of application methods for control of lettuce aphids. University of Arizona 2001 Vegetable Report. Quarles, W. 1994. Neem Tree Pesticides Product Ornamental Plants. The IPM Practitioner. 16(10) 1-13. Ruckin, F.R., (ed). 1992. Neem, A Tree for Solving Global Problems. National Academy Press. Washington, D.C.
Smitley, D. R. and T. W. Davis. 2000. Twospotted spider mite on marigold in the greenhouse. Arthropod Management Tests 25: G62. Stark, J. D. and J.F. Walter. 1995. Neem oil and neem oil components affect the efficacy of commercial neem insecticides. J. Agric. Food Chem. 43: 507-512. Thacker, J.R.M. 2002. An Introduction to Arthropod Pest Control. Cambridge University Press. Weinzierl, R. and T. Henn. 1991 Alternatives in Insect management: Biological and Biorational Approaches. North Central Regional Extension, Publication 401. Trans R Soc Trop Med Hyg. 2005 Oct;99(10):769-74. Phase I safety study of Praneem polyherbal vaginal tablet use among HIV-uninfected women in Pune, India. Ecotoxicol Environ Saf. 2004 Nov;59(3):332-9. Biochemical effects of vepacide (from Azadirachta indica) on Wistar rats during subchronic exposure. J Ethnopharmacol. 2004 Sep;94(1):25-41. Safety evaluation of neem (Azadirachta indica) derived pesticides. Chembiochem. 2004 Apr 2;5(4):408-21. Neem--an omnipotent plant: a retrospection. J Basic Clin Physiol Pharmacol. 2003;14(4):387-95. Azadirachta indica adversely affects sperm parameters and fructose levels in vas deferens fluid of albino rats. Life Sci. 2002 Nov 1;71(24):2845-65. 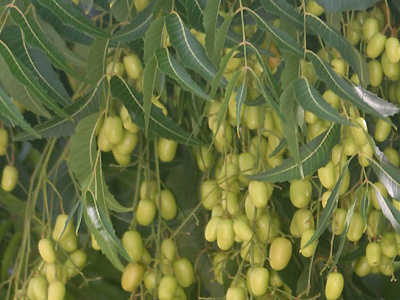 Gastroprotective effect of Neem (Azadirachta indica) bark extract: possible involvement of H(+)-K(+)-ATPase inhibition and scavenging of hydroxyl radical. Food Chem Toxicol. 2001 May;39(5):477-83. Azadirachtin, a neem biopesticide: subchronic toxicity assessment in rats. Pharmacol Res. 2000 Apr;41(4):419-22. How safe is neem extract with respect to thyroid function in male mice? Immunol Cell Biol. 1997 Apr;75(2):190-2. Plant immunomodulators for termination of unwanted pregnancy and for contraception and reproductive health. Puri H.S. 1999. Neem-The Divine Tree. Harwood Academic Publishers, Amsterdam. Ragasa C.Y., Nacpil Z.D., Natividad G.M., Tada M., Coll J.C. and Rideout J.A. 1997. Tetranortriterpenoids from Azadirachta Indica. Journal of Phytochemistry. 46: 555-558. Johnson S., Morgan E.D. and Peiris C.N. 1996. Development of the Major Triterpenoids and Oil in the Fruit and Seeds of Neem (Azadirachta indica). Journal of Annals Botany. 78: 383-388. Mongkholkhajornsilp D., Douglas S., Douglas P.L., Elkamel A., Teppaitoon W. and Pongamphai S. 2004. Supercritical CO2 Extraction of Nimbin from Neem Seeds-A Modeling Study. Journal of Food Engineering. 71: 331-340. Adeeko K.A. and Ajibola O.O. 1990. Processing Factors Affecting Yield and Quality of Mechanically Expressed Groundnut Oil. Journal of Agricultural Engineering. 45: 31-43. Khraisha Y.H. 2000. Retorting of Oil Shale Followed By Solvent Extraction of Spent Shale: Experiment and Kinetic Analysis. Journal of Energy Sources. 22: 347-355. Levenspiel O. 2003. Chemical Reaction Engineering. 3rd Ed., John Wiley and Sons Inc., New York. Choe E. and Min D.B. 2006. Mechanisms and Factors for Edible Oil Oxidation (Comprehensive Reviews in Food Science and Food Safety, Volume 5), Institute of Food Technologies, Ohio. ZMin D.B. and Steenson D.F. 1998. Crude Fat Analysis. Food Analysis. pp. 201-216. Fasina O.O. and Ajibola O.O. 1989. Mechanical Expression of Oil from Conophor Nut. Journal of Agricultural Engineering. 44: 275-287. Nielsen S.S. 1998. Food Analysis. An Aspen Publication, Maryland, USA. Engineers S.B.o.C. 1998. SBP Handbook of Oil Seeds, Oils, Fats and Derivatives. SBP Consultant & Engineers Pvt. Ltd., New Delhi. Herodez S.S., Hadolin M., Skerget M. and Knez Z. 2002. Solvent Extraction Study of Antioxidants from Balm (Melissa officinalis L.) Leaves. Journal of Food Chemistry. 80: 275-282.